Chocolate Italian Cake is German Chocolate Cake meets Italian Cream Cake in a most delicious way. 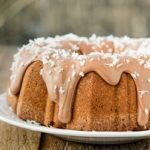 It is baked in a bundt pan and topped with Chocolate Cream Cheese Glaze. Preheat oven to 325°F. Lightly grease and flour a 12-cup bundt cake pan. Whisk together flour, cocoa powder, baking soda, and salt in a medium bowl. Beat egg whites in a large bowl at high speed with an electric mixer until stiff peaks form. In a separate large bowl, beat butter and shortening until creamy. Gradually add sugar and beat well to combine. Add flour mixture in three additions, alternatively with buttermilk in two additions, mixing on low speed until just combined. Do not over-mix. Stir in vanilla, coconut, and pecans. Fold in egg whites. Pour batter into prepared pan. Bake for 55 to 60 minutes or until a toothpick or cake tester inserted in the center comes out clean. Cool cake in pan for 12 minutes. Remove cake from pan and cool completely on a wire rack. Beat cream cheese, butter, and salt until creamy. Add confectioners sugar, cocoa powder, and 4 tablespoons half-and-half. Beat or stir until combined. Add more half-and-half in 1/2 tablespoon (or less) increments until desired consistency is reached. Try not to get it too thin as you want a thick layer of glaze on the top of the cake. Spoon glaze over top of cake. Sprinkle coconut flakes on glaze. Refrigerate cake when not serving. Chocolate Italian Cake with Chocolate Cream Cheese Glaze is German Chocolate Cake meets Italian Cream Cake in a most delicious way. It's a bundt cake too.